Original St. Stanislaus Church 1887. Note the rectory in back. After the first Poles, Andrew and Catherine Mendlewski and their six children arrived in Erie on May 30, 1868, the Polish population grew steadily. Approximately l5 years later the Reverend Anthony Klawiter of Dunkirk, New York encouraged the now small settlement of Poles to purchase six lots at the corner of l3th and Wallace Street. The lots were designated as a starter for organizing a parish for these Polish families. Several years before, this was marshy and grazing land for sheep. 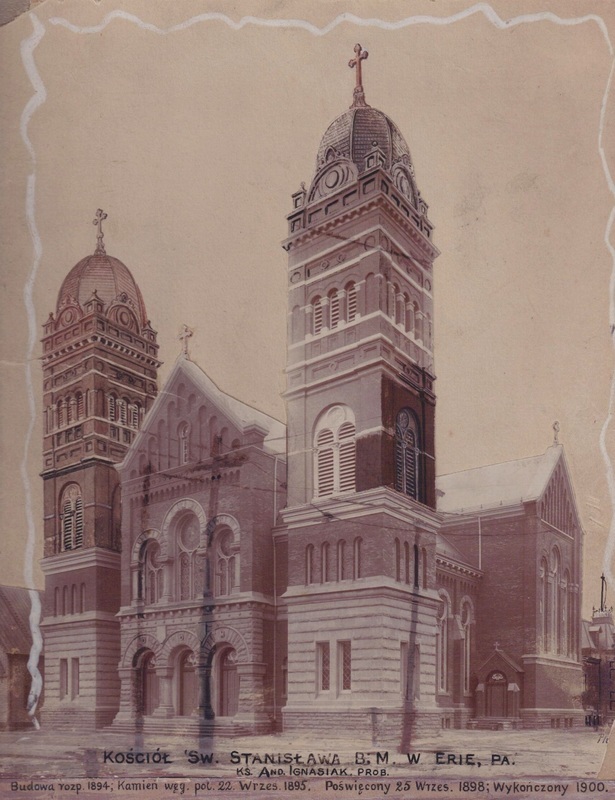 By 1883, there were 85 Polish families in the city of Erie, most of whom attended services at St. Mary's Church a German Parish on East Ninth Street. The people sought their own priest who would cater to their spiritual needs. The Polish settlers petitioned the Most Reverend Tobias Mullen, then Bishop of Erie, to help them. 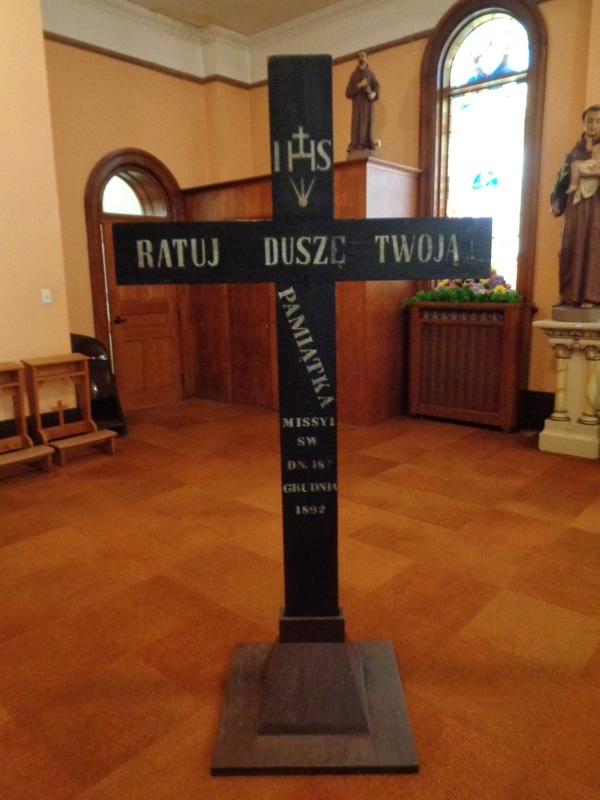 A Benedictine priest, the Reverend Karol Lanz, from Buffalo and Pittsburgh initiated a house-to-house canvas for the purpose of collecting funds to begin a Polish Parish. He collected a total of $1,963.50. The money was used to purchase materials to begin construction of an edifice 40 feet by 80 feet. All work was to be done by volunteers. On October 19, 1884, Bishop Mullen blessed the cornerstone. A year later on October 11, Bishop Mullen blessed the church which was dedicated to St. Stanislaus, Bishop and Martyr. The ceremony was organized by the Society of the Sacred Heart of Jesus, an organization of men who were chartered as a Society on September 20th of that year. There were 50 charter members in that Society. Temporarily, the Benedictine Fathers assumed leadership of the new church. Also, during this first year a Mr. Michael Konkol was asked to assume the duties of being the church organist. During the Vesper Services on Sunday, August 22, 1886, the Most Reverend Bishop Mullen formally installed the first resident pastor, Reverend Andrew Ignasiak. Since there was not yet a rectory, Father Ignasiak was forced to live away from the church. His temporary residence was on East Seventh Street. One week after the installation, Father Ignasiak outlined plans for a new rectory adjacent to the church. On April l, 1887, the pastor moved into the permanent rectory. After settling in his new home, the pastor turned his attention to providing school facilities. Two rooms in the rectory were utilized for this purpose. Classes were started in the Spring of 1887 for 70 children who were taught by the pastor, himself. During the first school year, 11 children participated in the church's First Holy Communion. Rev. Andrew Ignasiak. 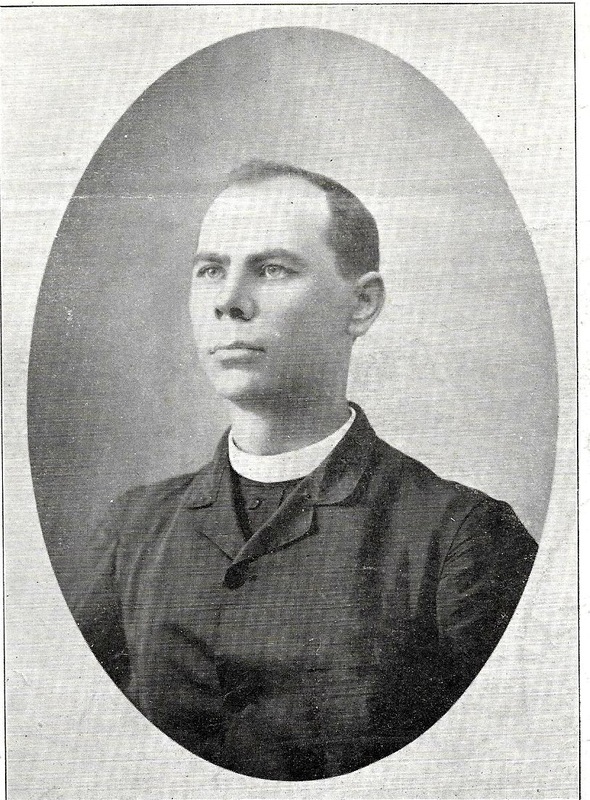 Pastor 1886-1934. In October 1887, six lots of land were purchased on the corner of 12th and Wallace for the purpose of building a school. Plans were formalized in October, and in May, l888, construction was started on a two-story wooden structure. Formal dedication took place on September 2, 1888. The following day, 100 students reported to school. The teaching staff consisted of the pastor and the new church organist, John Nowak. By 1890, 200 families made up the congregation. This necessitated the hiring of two full-time teachers. There were 142 persons in the first Confirmation class that year. In the fall of 1891, the Parish Hall and Auditorium were erected along East 13th Street just beyond the rectory. It was a frame structure that was formerly dedicated by the Most. Rev. Bishop Tobias Mullen on the 29th of November of that same year. 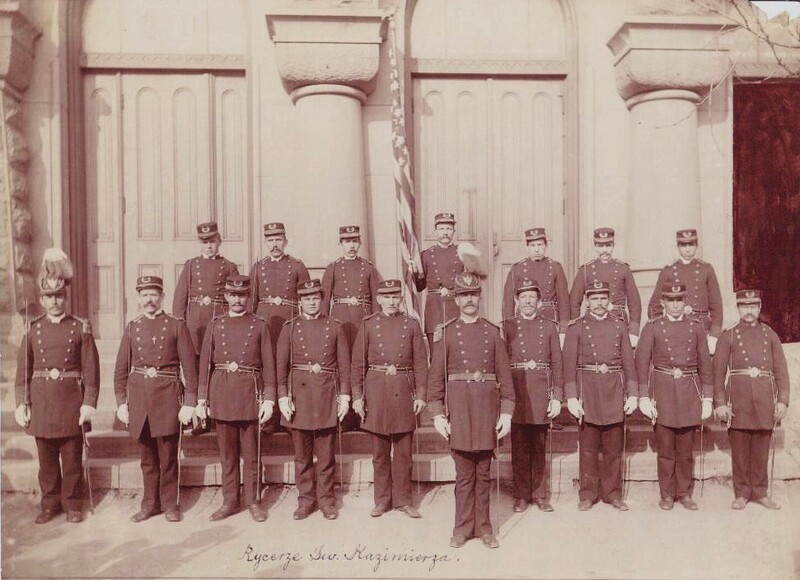 During the month of November 1891, the Moniuszko Singing Society was organized, the club rooms of which are located today at 12th and Reed Street. The Society, at that time, contributed greatly to the cultural life of the Poles in Erie, in that it maintained a library of considerable size for the benefit of the parishioners. In addition, it frequently presented stage plays that provided edification as well as relaxation to the hard working people in the parish. 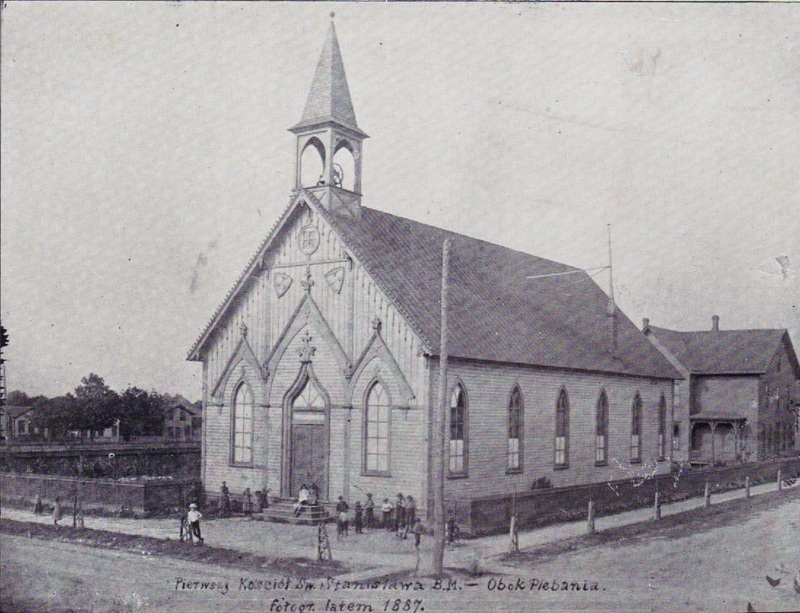 On January l, 1892, the annual parish meeting was held. At this meeting, the Felician Sisters assumed leadership of the school. The total school enrollment numbered 240 children. A portion of the school building was remodeled to house the Sisters. During December, 1892, the first mission services in the history of the parish were conducted by Father W. Sebastyarski, S.J. Cross from first parish mission. December 1892. In 1893, the greatest expansion and organization of church societies took place: the Sacred Heart Benevolent Society organized September 22, 1885; the St. Stanislaus Benevolent Society in 1889; the Women's Rosary Society in October, 1886; the Matki Bożej Częstochowskiej Benevolent Society in l893; The Young Ladies Society of the Immaculate Conception in l890; and a Children’s Society of the Infant Jesus. The Young Men's Society of St. Stanislaus Kostka in 1895; the Knights of St. Casimir in the spring of 1892; and the Society of Women under the name of the Apostleship of Prayer in February 1893, as well as the St. Hedwig's Circle Group #515 of the Polish Women’s Alliance. The parish was growing almost daily. Standing room was at a premium for practically all services. The need for a new and much larger church was unquestionable. Since the parish was debt free at the time, the plans for a new church were evolved. During the month of July, 1894, the wooden church was moved to the playground. Work was immediately begun on laying the foundation for a church building that was to be 66 feet wide in the nave and 147 feet long. On February 8, 1895, fire destroyed the rectory. Work was immediately begun on a new brick replacement, the present rectory. By September l2th, the pastor was able to occupy his new quarters. Ten days later, with the basement of the church completed and covered, the cornerstone of the present St. Stanislaus Church was blessed by Bishop Mullen. In 1896, the outside work of this new Roman style church was completed except for the two 135-foot steeples. For economic reasons, this work was deferred. During the summer of 1896, a piece of property facing the church on Wallace Street was purchased and the school building was moved to this location. In the early months of 1897, considerable headway was made on the interior of the church. By the first of April, the first services were held in the new church. Construction of the woodwork, plastering, painting, setting of the altars, installation of the pews and the organ were completed during the remainder of 1897 and 1898. On Sunday, September 25, 1898, the Most Reverend Bishop John E. Fitzmaurice formally dedicated the present St. Stanislaus. That afternoon, the Sacrament of Confirmation was administered. On the following day, the opening of Forty Hours Devotion took place. 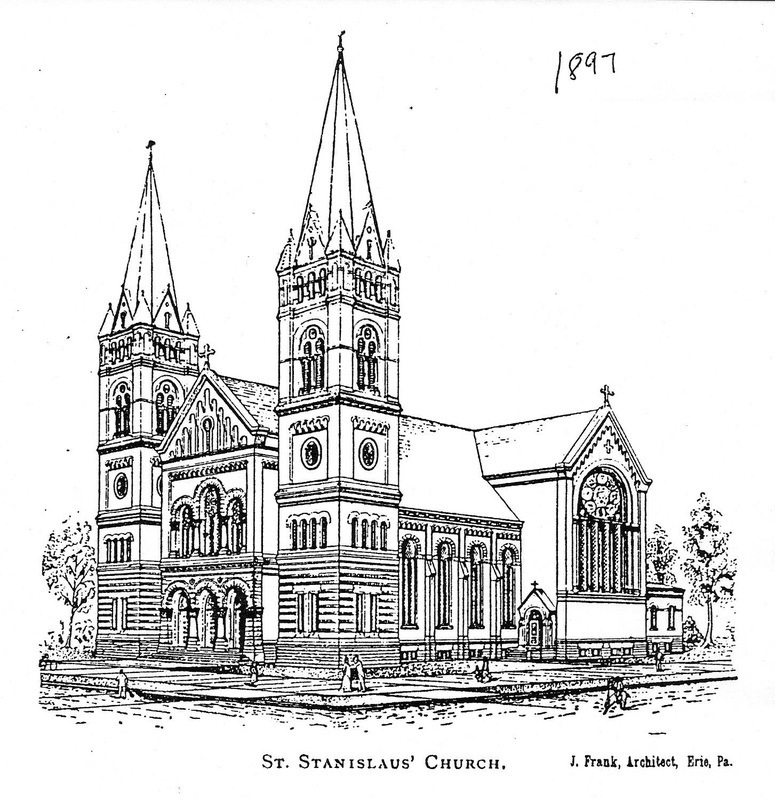 Architect J. Frank's rendering of the proposed St. Stanislaus Church 1897. St. Stanislaus Church 1900. Note the steeples are drawn in as they were not yet competed. Also notice the effect used to hide the telephone wires. On January l, 1900, a fire in the sacristy destroyed the interior and did considerable damage to the church proper. As a result, it was necessary to rebuild and repaint the present interior. During May of the same year, the parish was provided with three bells which were purchased by various societies. Shortly after, work was begun on the construction of the two church towers. In September of 1900, over 500 children enrolled for the school year, many more than could be suitably accommodated. The congregation decided that the building of a new and larger school could not be delayed. It was completed in 1901. The new school had an enrollment of 650 children in its regular grades plus 120 in the newly opened kindergarten. There were ten Sisters of the Felician Order in charge. They were assisted by John Nowak, a lay teacher who was with the school from the very first day of its organization. Nowak, who was also the choirmaster and organist, organized an all-male choir. The first three-voice Mass was sung on Christmas Day, 1901. 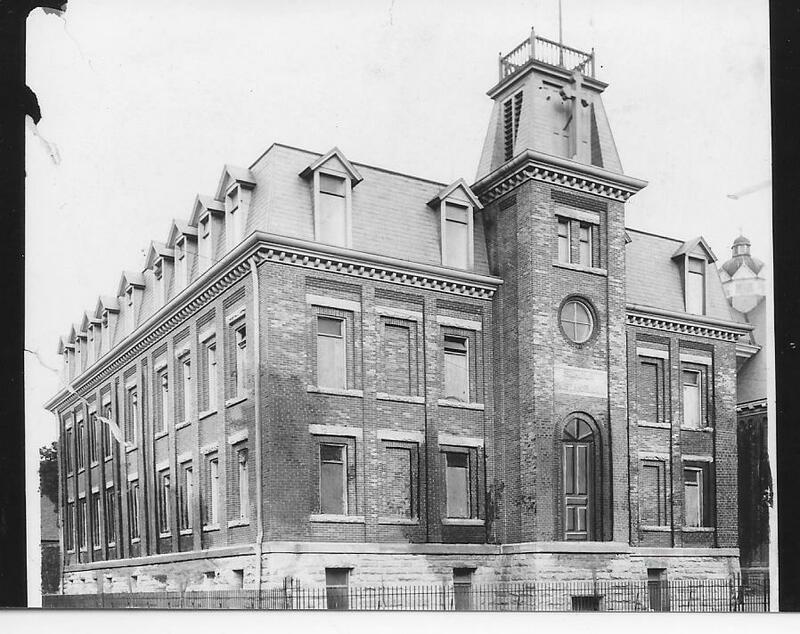 St. Stanislaus School under construction circa 1901. Note the door is drawn in. 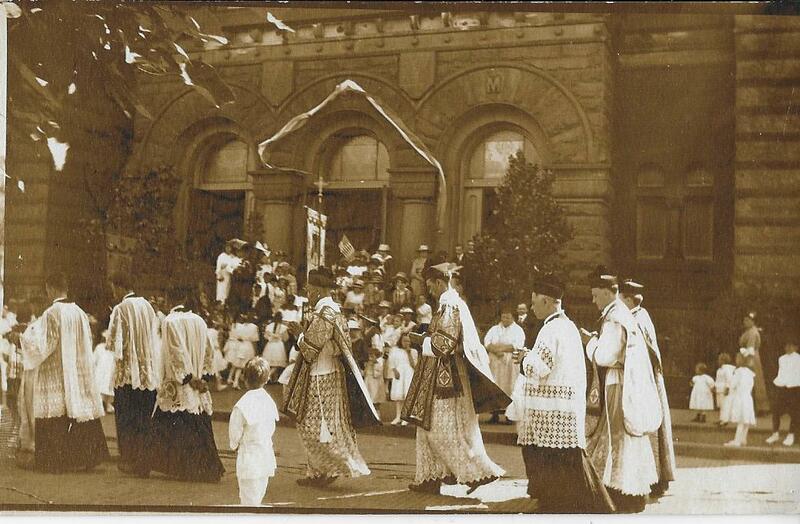 The first annual Corpus Christi Procession took place in 1902 in the streets adjacent to the church, and it still attracts hundreds of adorers from the Erie area. During the year 1905, the present Kosciuszko Hall was built along East l3th Street just beyond the rectory. It replaced the old frame parish hall and auditorium which was later moved to the corner of l2th and Reed Street. It became a furniture warehouse. The Sisters of the Holy Family of Nazareth took charge of St. Stanislaus School in 1915. That same year, the Sisters' convent was built on East l2th Street. World War I claimed the lives of thirteen young men of the parish. A total of 357 were in the Armed Forces. On August 19, 1919, St. Stanislaus Church was consecrated by the Most Reverend Bishop John Mark Gannon D.D., D.C.L., L.L.D. To provide educational and recreational facilities for youth a major step was taken in 1920, namely, the founding and building of the CYMA Club - later to become the East Side Boys Club. A year later on September 14, 1921, Bishop Gannon blessed the building. As a youth center, it contributed immensely to the recreational life in the community. In September of 1920, St. Stanislaus High School was organized. It was housed in the C.Y.M.A. building and began with a class of ten students. Three courses, Academic, Commercial and Scientific were taught. Maintenance of the high school proved too much of a burden to the parish during the depression years of the thirties and it was closed in 1938. All totaled, 160 boys and girls were graduated from the school. Peak enrollment at St. Stanislaus Grade School was reached in 1922 when more than 1,100 children attended. This was the largest parochial school attendance in the entire diocese. 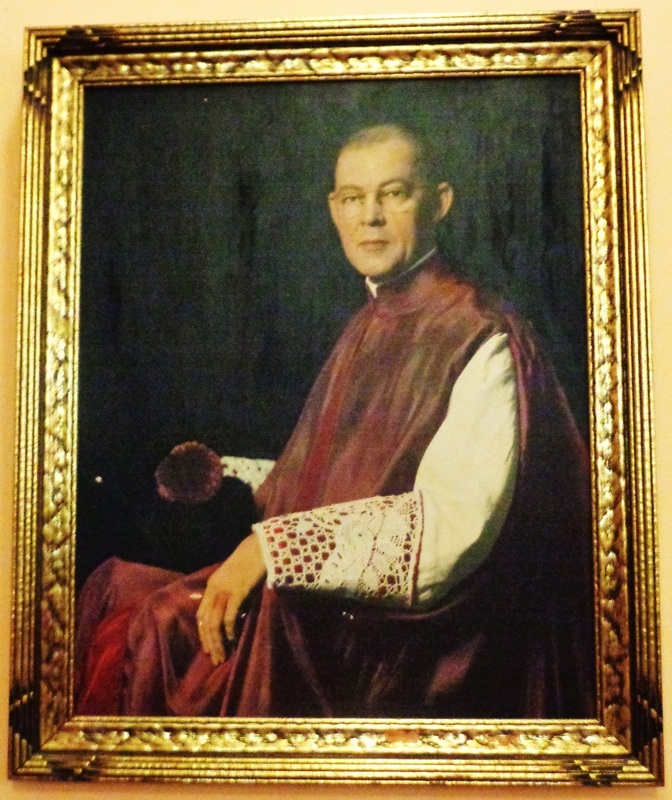 On May 9, 1928, Father Ignasiak was elevated to the dignity of Domestic Prelate by His Holiness, Pope Pius XI. He was invested by Bishop Gannon on August l, 1928. He was the first Monsignor of Polish descent in the history of the Diocese of Erie. Monsignor Ignasiak served as pastor for forty-eight years. He died on December 29, 1934 and was buried on January 2, 1935. His successor was Reverend Wladislas J. Stanczak who had been assistant to Monsignor Ignasiak for sixteen years. He was appointed by Bishop Gannon on May 8, 1935. In December, 1941, the United States became involved in World War II. St. Stanislaus Parish came forth with 774 young men and women who served in the Armed Forces. Twenty-two made the supreme sacrifice. In the year 1945, St. Stanislaus Church was repainted and redecorated. In May 1947, His Holiness Pope Pius XII conferred Knighthood of St. Gregory on James E. Robaszkiewicz, a son of St. Stanislaus Parish, making him the first Knight of Polish descent in the Diocese of Erie to receive this distinction. Through the recommendation of His Excellency Most Reverend John Mark Gannon, Bishop of Erie, Father Stanczak was elevated to the dignity of a Domestic Prelate by His Holiness, Pope Pius XII. Monsignor Stanczak was invested at St. Peter's Cathedral by Bishop Gannon on July 29, 1949. In 1951, the present St. Stanislaus School and Kosciuszko Hall were renovated and a cafeteria was installed. In 1959, the altar railing was moved, the sanctuary enlarged and a clock installed in the church tower. In 1960, St. Stanislaus Church celebrated its 75th anniversary and the Reverend Bernard A. Janczewski of Utica, New York became the first priest from St. Stanislaus to be elevated to Domestic Prelate by His Holiness Pope John XXIII. On September 25, 1962, the second pastor of St. Stanislaus Church, Monsignor Wladislas J. Stanczak died. The appointment of Reverend Joseph Radziszewski as pastor followed in November, 1962. In 1963, the interior of the church was repainted and the exterior sandblasted. The task of maintaining the parish property continued. The major project in school was the installation of closed stairwells and the renovation of existing facilities for the security and comfort of the students. The convent was also remodeled in 1980. New appliances and safety features were installed in the cafeteria and auditorium. New furnishings were added to the church to further enhance its traditional charm. Reverend Joseph Radziszewski Pastor 1962-1989 at Corpus Christi Procession late 1970s early 1980s. (l to r) Jane Golab, Phyllis Kuklinski, (three unknown), Father Joe, Dorothy Wozniak Heintz, Helen Klan (the back of her head), Josephine Sutley, Esther Sheppard, (two unknown) and Sophie Zollum. 1985 was the Centennial Year. 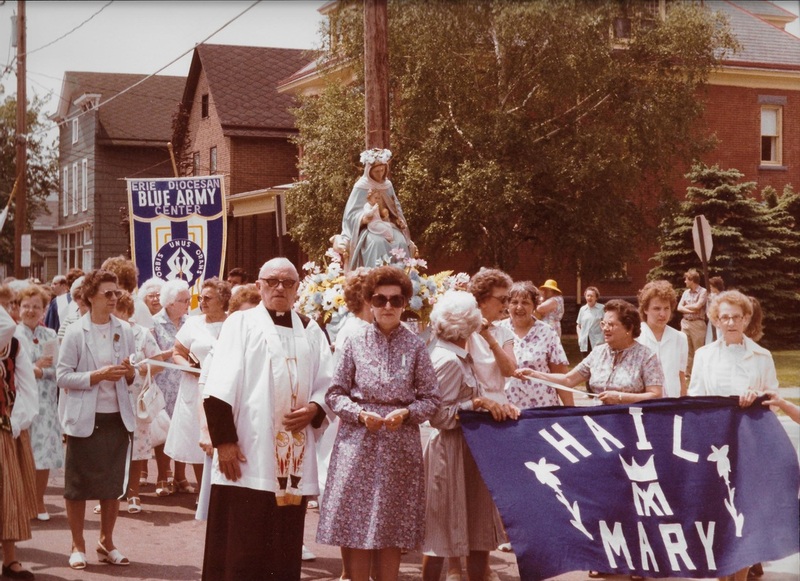 The observance of the l00th anniversary to the parish began with a program, "Centennial Echoes," presented by the school children, 225 in number, on June 5, 1985. On September l3th, the Moniuszko Singing Society sponsored a Centennial dinner dance attended by past and present members of our parish. On September 25th, Bishop, Michael J. Murphy offered a Mass of thanksgiving as the highlight of our centennial celebration. Concelebrating with him were Father Joseph Radziszewski, the pastor; two Polish Monsignors of our diocese, John D. Daniszewski and Joseph V. Reszkowski; former assistants in our parish; and Father Joseph Kacprowicz, oldest living former assistant. Present in the sanctuary was Monsignor Bernard A. Janczewski, oldest living native son ordained from the parish. Other concelebrants were either native son-priests or those formerly associated with the parish, as well as many friends from neighboring parishes. Among the guests participating in the festivities was Sister Janice Fulmer, Provincial Superior of the Sisters of the Holy Family of Nazareth, plus a group of Sisters who taught in our school in former years. The Sisters of Nazareth, who came to our parish in 1915, observed the 70th anniversary of teaching children in our parish school. On Sunday, October 20th, the combined societies of the parish conducted a Centennial Parish Day Celebration, featuring a dinner served throughout the afternoon and festival games in the afternoon and evening. In May, 1989, a study was done, sponsored by the Erie Diocese, regarding the parishes of "east side" Erie. The Neil Meitler study recommended that both St. Stanislaus Parish and School be closed. The pastor at that time, Rev. Joseph Radziszewski, retired on May 31, 1989. The Rev. Bernard J. Urbaniak, a native son of the parish, was appointed as the administrator of the parish. The task was assigned to Father Urbaniak by the bishop to form a parish committee that would respond to the Neil Meitler recommendations. A select committee was formed. The work of the committee was completed in September of 1989. The results were submitted to then Bishop Michael Murphy for review. After reviewing the results of the select committee, Bishop Murphy announced on January 6, 1990, that St. Stanislaus Parish and School would remain open. It was on the same date that Rev. Bernard J. Urbaniak was named as the fourth pastor of the parish. During 105 years of parish history only four pastors have been named for the parish. During the next two years, $200,000 was spent in much-needed physical repairs to the parish buildings and grounds. In addition, many programs have been added to the life of the parish. A Parish Minister and a Director of Religious Education were hired. In August, 1991, Father Mark L. Bartchak Ph.D., Judicial Vicar of the Erie Catholic Diocese was assigned to reside in the parish and provide weekend assistance. A Pastoral Council was re-established in the parish as well as a Finance Council. Lectors and Extraordinary Ministers of the Eucharist were installed to assist with the liturgies. A Care and Concern group was organized to provide assistance to members in need. Small faith-sharing groups were organized. In September, 1994, Pope John Paul II named the pastor, Rev. Bernard J. Urbaniak as a Chaplain to His Holiness with the title of Reverend Monsignor. While new programs came into existence, other aspects of the parish ceased to exist. In September, 1993, steps were taken to approach the Erie Redevelopment Authority regarding the demolition of the "Boys' Club" building. It was Father Urbaniak's hope that the building could be rehabilitated after years of neglect and being empty. However, the estimated cost of making the building usable was over $l million. Because of the problems involved, it was decided to with plans to demolish the building. The building had a proud history. It served not only the parish but the whole "east side" of Erie as an educational, social and cultural center. It was only when more modern and functional facilities were constructed by neighboring parishes that the facility began to show its limitations. In December, 1994, through the leadership of Ben Dombrowski, funding was secured to demolish the building. The actual demolition took place during March and April, 1995. The last building constructed in the parish complex became the first to fall. 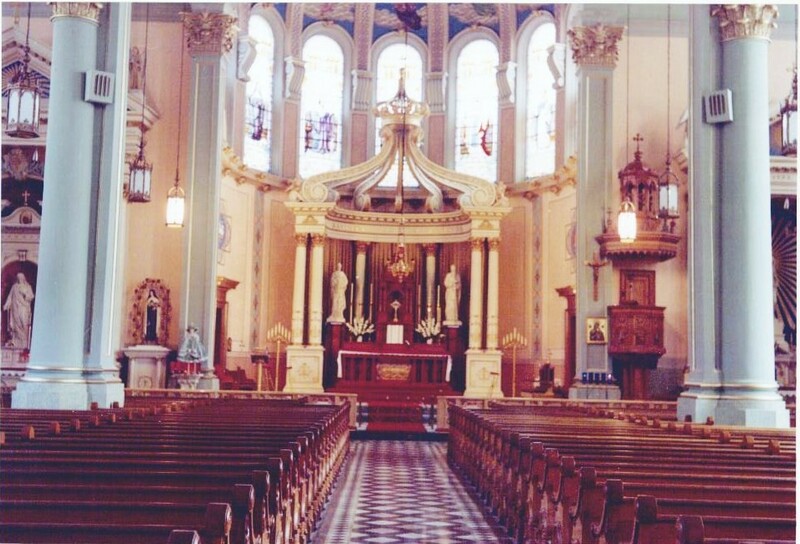 At the May, 1993, meeting of the Pastoral council, Father Urbaniak suggested that in 1998 the Church building will have been dedicated 100 years ago and that perhaps with an anniversary in sight, the parish should began planning to renovate the interior of the church. The last painting of the interior took place in 1963. Not only was the paint faded and dirty, but water leaks over the years had damaged the interior plaster. The exposed steam pipes presented a real liability and a danger. After periodic discussion and reflection, in the Spring of 1995, members of the Pastoral Council were asked to nominate other members of the parish to serve on a "Renovation Committee." Those who volunteered to serve from the nominations were Stanley Bialomizy, Jim Burke, Doris Inter, Carl Klan, Walter Lubiejewski, Dan Pomorski, Ray Przybyszewski, Shirley Widomski and Henry Wozniak. The committee began to meet in the Fall of 1995. Jim Burke and Dan Pomorski were subsequently elected as co-chairmen. Eventually, the committee decided to hire Michael DeSanctis, Ph.D., professor of Fine Arts, Gannon University as a liturgical consultant. He was hired to lead the committee and eventually the parish in an educational process which would lead to a workable plan for the renovation of worship space. A series of educational meetings was scheduled for the committee. Afterwards, a series of "town meetings” were held to acquaint the parish members with the liturgical norms developed by the church since the Second Vatican Council. The process began in May, 1996, and continued through the month of August. For those who attended, the process proved to be challenging, yet productive. In July, 1996, some concern surfaced as to whether or not the structure of the building was sound - would it be worthwhile to expend the money to renovate? An architect was hired to appraise the building's integrity. A proposal submitted by the firm of Evans/Salata was accepted for the appraisal which was completed by October. At the January 13, 1997, meeting of the committee, it was decided that the appraisal indicated that the building was structurally sound but in need of repair. The committee decided to continue with the process. Michael DeSanctis established a timetable so that interviews of prospective architects would take place in April, 1997. As a result of the interviews, the firm of Weborg/Rectenwald Architects, Inc. of Erie was chosen as the project architect. Subsequently, the committee met with Mr. Bill Weborg and members of his staff to begin actual planning for the renovation. With much prayer, reflection, discussion, and honest interaction, the committee members met throughout the Summer and Fall of 1997. A consensus was finally reached regarding a plan for the renovation. In November, a model of the church with the proposed alterations was presented to the members of the parish. The estimated cost of the project was placed at $1.6 million. It should be noted that during the Summer of 1997, a new floor was installed throughout the first floor of the Parish Hall. This was done mainly through the efforts of parish volunteers. The project was completed with the idea that once the renovation of the church building began, worship would necessarily be moved into the Parish Hall. Late in 1997, a Fund Raising Committee was formed. The task of the committee would be to formulate plans to raise money for the proposed renovation. Members of that committee include: Gene and Elaine Dombkowski, Michele Inter, Val V. Jaskiewicz, Marty and Kathy Karpik Joseph Konkol, Art and Nancy Kujawinski, Dave and Stanley Lesnieski, John and Joan Oldenski, Rolf and Dotti Pedersen, Ed and Evelyn Selleny, Jean Wiertel, Stephanie Wycech and Jackie Vargo. In March, 1998, the committee hired Jack Kearns of Kearns & Associates of Orchard Park NY, to supervise the fund raising appeal. After examining the parish financial records, he estimated that a total of $800,000 could be raised. The kick-off for the appeal was set for the weekend of September 12 and 13. As the fund raising appeal began, it became apparent that even though the parish might be able to raise $800,000, in all probability we would not be able to raise the money for the entire project. Early in the Spring of 1999, the architect had divided the work to be done into three phases. 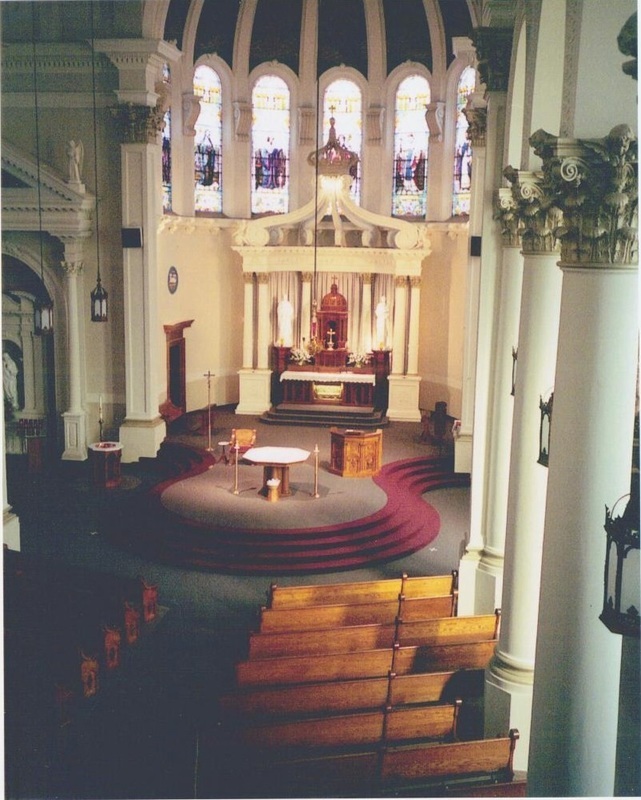 Phase one would include work on the entire exterior shell of the building, replacement of the heating system inside the church, repair to damaged plaster, repainting of the interior, installation of new flooring, construction of an extension of the sanctuary area, a handicap ramp to allow for access to the sanctuary area, new confessional rooms, enhancement of the lighting and reconfiguration of the seating. The estimated cost for this work was $800,000. Phase Two and Phase Three would be put off until a later time. In May, 1999, Bishop Trautman gave his approval to begin the work. The architect then proceeded to draw up plans for the anticipated work and to contact prospective contractors. Because of a generous gift from a member of the parish, work began in the Fall of 1999 on the new front entrance to the church. Work on the interior of the church began in earnest the first week of May, 2000. Because of the generosity of the members of the parish, more than $800,000 has been pledged toward the renovation fund. Gifts continue to be given to the fund. Re-dedication of the church took place October 8, 2000 at the 11:00 am liturgy. Church after renovation October 2000. Bishop Donald Trautman announced in February 2001, that the 112 year old St. Stanislaus School would close at the end of the 2000-2001 school year, due to dropping enrollment and financial problems. In 2011, Msgr. Mark Bartchak was named Bishop of the Altoona-Johnstown Diocese. 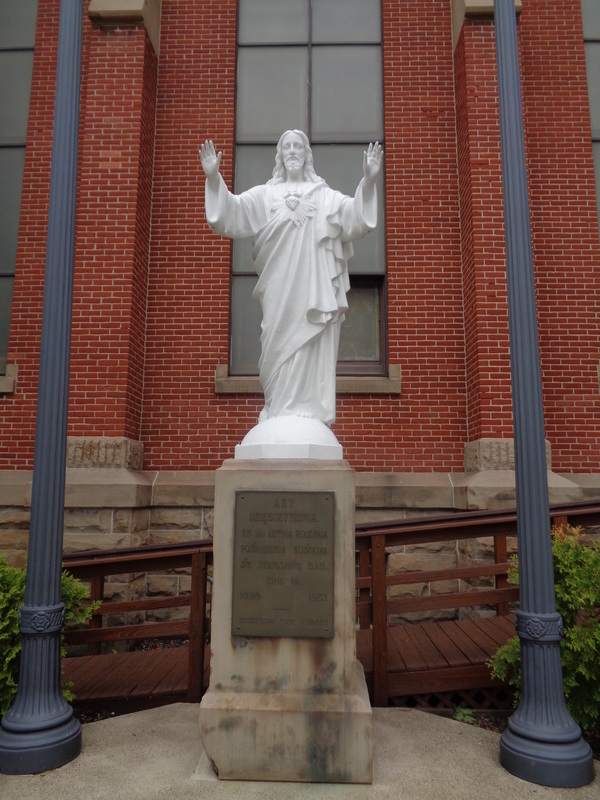 On July 26, 2015, St. Mary of the Immaculate Conception Church (The former black Catholic Immaculate Conception and the German founded St. Mary’s Churches that were merged in 2009,) closed and merged with St. Stanislaus, and St. Martin de Porres Statue from Immaculate Conception was moved to St. Stanislaus. Deacon Robert Walker also joined from the closed Parish. After months of study and feedback the Diocese decided to merge St. Hedwig Church with St. Stanislaus and Holy Trinity Church would be become a partner Parish. This went into effect February 13, 2017. St. Hedwig will remain a secondary Church. Rev. Msgr. Bernard Urbaniak remains the Pastor of St. Stanislaus with Rev. Msgr. Daniel E. Magraw as associate Pastor. Msgr. Magraw will be residing at Holy Trinity. The Parishes will also share Deacons Robert Walker and Thomas Matusiak. Niech będzie pochwalony Jezus Chrystus! Praised be Jesus Christ!